From these early years of studying on she gave concerts at guitar festivals like the festival “Young Talents” in Nürtingen (Germany) in 2009 and successfully took part in various national and international competitions such as “Jugend musiziert”, the international guitar competition “Anna Amalia” in Weimar (2007/2011) or the “RAGO Competition” in Stuttgart (2009) among others. Currently Isabella was awarded the fourth prize at the prestigious XVIII International Guitar Festival in Coria (Spain) and the third prize at the IX Concurso Internacional “Norba Caesarina” (Cáceres, Spain). 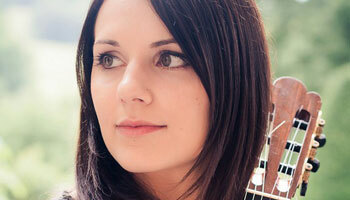 In April 2013, she gave a concert during the International Guitar Festival in Augsburg next to artists like Zoran Dukic, the Alegrias Guitar Trio or the “Joscho Stephan Trio”. In the field of chamber music, together with the guitar ensemble “El Polifemo” conducted by Johannes Stickroth, Isabella received the 1st prize with outstanding success at the German Competition for Orchestras in Wuppertal in 2008. Both in 2004 and in 2007 she was awarded a scholarship from “Stadtsparkasse Augsburg”. From 2010 to 2015 Isabella studied at the Liszt School of Music in Weimar with professor Thomas Müller-Pering and recently spent a year studying in Barcelona at the “Escola Superior de Música de Catalunya” where she continued her musical education with professor Laura Young as a scholarship holder of the Swiss “Thyll-Foundation”. In autumn 2015 she will continue with prof. Young for a master’s degree at the Mozarteum in Salzburg (Austria). In her current repertoire, she focuses especially on pieces by British and Spanish composers of the 20th century. Before and during her studies Isabella took part in various master classes where she obtained classes with renowned artists like Rafael Aguirre, Pavel Steidl, Judicael Perroy, Johannes Monno, Carlo Marchione, Olaf van Gonnissen or Carles Trepat among others.